When it comes to replacing missing teeth, you have a lot of options. While dentures and a bridge and crowns were typically used in the past, there is a new preference to replace teeth. 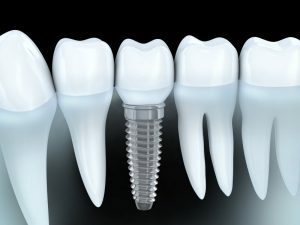 Dental implants have quickly become the preferred solution for tooth loss. More than 500,000 dental implants are placed each year because they offer a permanent option that holds over a 95% success rate. As a dentist in Medford, Dr. Anthony Giamberardino will restore your smile with the only option that most closely mimics natural teeth. Traditional dental implants are composed of three parts: the implant post, healing cap, and abutment. The implant post is surgically inserted into the jawbone to replace the root of the tooth. Since the post is made from biocompatible titanium, the jawbone fuses to the post to create a secure foundation for the dental crown. After the jawbone has healed, a healing cap is attached to the post. This allows the gum tissue to heal correctly while also being necessary to attach the dental crown. A couple of weeks after the healing cap is placed, the dental restoration is attached to replace the tooth. Dental implants can be used to treat all cases of tooth loss, even for those missing more than one tooth. Those who are missing two or more teeth in a row undergo a similar procedure. However, each tooth in not replaced individually. Instead, a bridge of teeth is created, which is held in place by two implant posts. Complete tooth loss can also be treated with dental implants. An arch of teeth is created that is similar to that of traditional dentures. Then, the arch is held in place using an average of 4 dental implant posts. Many of our patients turn to dental implants in Medford due to the superior benefits they offer. Not only do you gain a lifelong solution to replace your teeth, but you also improve your quality of life with convenience. Caring for dental implants is like caring for natural teeth. You do not need expensive cleaning solutions. In addition, you have a confident, secure solution because you will not need adhesives. You can eat and speak with confidence without having to worry about slipping or irritation. Best of all, dental implants promote your oral health. Tooth loss causes your bone density to decrease. However, since implant posts are placed into the jawbone, the bone remains stimulated to preserve your bone. This not only protects remaining natural teeth from damage, but offers your facial structures proper support. If you are ready to restore your smile with dental implants, you need to schedule a consultation with Dr. Giamberardino. Dr. Giamberardino will evaluate your oral health, medical history, and lifestyle to ensure you are a candidate for the procedure. A comprehensive treatment plan will be created to begin restoring your smile. Benefit from the best option to treat tooth loss with dental implants!